I know it’s a little early to talk about my birthday celebration but you know how much I LOVE birthdays! Even at 5-0, I’m kinda sure I would still be organizing birthdays with themes. LOL by then we’ll go easy with the food selection, venue and I’ll provide cups for us all to put our dentures!! 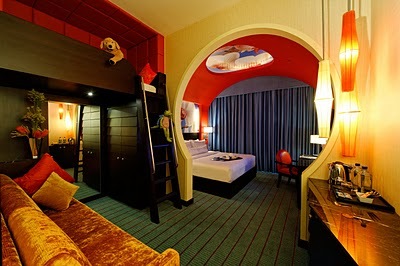 I kinda want to celebrate my birthday this year at Festive Hotel, Sentosa. GORGEOUS GORGEOUS room settings; it look almost like a big playground with the deck bed, the colorful settings and space. D said I can do whatever I want but is it worth the splurge when we are going Japan in June?? I don’t know but the more I see it, the more I want it. If not, maybe a nice venue to party and dine with my girls then the actual day with family affair and baby? Anyway I’ve got the perfect theme for my birthday but I’m still thinking about the dress code. After bud and T’s birthday, I’m gona sooo prepare the props for my theme birthday!